South Gallia’s Kyle Northup (1) carries the ball behind a block from Gavin Bevan (17), during the Rebels’ loss to Southern on Sept. 28 in Racine, Ohio. 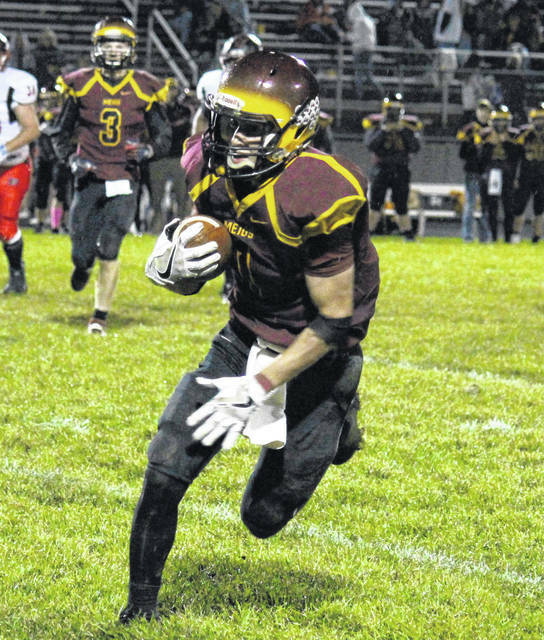 Meigs senior Zach Bartrum carries the ball after a reception, during the Marauders’ loss to Point Pleasant on Oct. 12 in Rocksprings, Ohio. A total of 21 players representing six teams within the Ohio Valley Publishing area were named to the 2018 All-Tri-Valley Conference football teams, as selected by the coaches within TVC Ohio Division and TVC Hocking Division. A dozen of the local selections were divided evenly between the Eastern, Southern, South Gallia and Wahama in the TVC Hocking, while Meigs and River Valley tallied six and three selections respectively in the TVC Ohio. The Marauders — who were tied with Nelsonville-York at 4-2 for runner-up in the seven-team league — were represented for the third consecutive year by seniors Cole Adams and Zach Bartrum. First-time selections for MHS were senior Claytin Neutzling, sophomore Abe Lundy, and freshmen Ty Bartrum and Coulter Cleland. River Valley — which was seventh at 0-6 in the TVC Ohio — was represented by a trio of seniors, Trevor Simpson, Layne Fitch and Dylan Lemley. Both Fitch and Lemley were also selected to the all-league squad last season. Eastern — which claimed fourth in the TVC Hocking with a 5-3 mark — was represented for a second straight year by seniors Blaise Facemyer and Nate Durst. First-time honorees for the Eagles were Sharp Facemyer, a senior, and Steve Fitzgerald, a sophomore. The Tornadoes — taking fifth in the league with a 4-4 record — have one two-time all-league selection in senior Austin Arnold. Seniors Logan Drummer and Auston Colburn, as well as junior Trey McNickle, were selected to the TVC Hocking football team for the first time. The Rebels — picking up sixth in the TVC Hocking with a 3-5 record — were represented for a second straight year by junior Kyle Northup. SGHS seniors Garrett Saunders and Gavin Bevan, and junior Justin Butler, each claimed their first all-league spot. Wahama — finishing eighth in the league with 1-7 mark — earned a quartet of first-time honorees, seniors Jacob Fisher and Brady Bumgarner, and juniors Abram Pauley and Brayden Davenport. The TVC Ohio champion Bulldogs swept the special awards in their division, with Clay Davis winning Offensive Player of the Year, Logan Maxfield grabbing Defensive Player of the Year, and Ryan Adams being named Coach of the Year. Trimble — the TVC Hocking champion and D-7 state runner-up — won two special awards, with Conner Wright being named Offensive Player of the Year, and Phil Farris winning Coach of the Year. Belpre’s Jesse Collins was the TVC Hocking Defensive Player of the Year. ATHENS (6-0): Clay Davis*, Logan Maxfield, Evan Steenrod*, Justin Hynes, Evan Adams, Caleb Rogers*, Nate Trainer, Eli Kennedy. NELSONVILLE-YORK (4-2): Keegan Willburn*, Donovan McCollister*, Brandon Phillips, Bryce Richards, Colton Snyder, Mikey Seel. MEIGS (4-2): Cole Adams*, Zach Bartrum*, Ty Bartrum, Coulter Cleland, Abe Lundy, Claytin Neutzling. VINTON COUNTY (3-3): Cade Sibner, Jacob Wells, Nick Pittman, Lincoln Hayes*. ALEXANDER (2-4): Kaleb Easley, Connor Kimbrough*, Ethan Howes, Michael Kelly. WELLSTON (2-4): Jonathon Garvin, Donnie Watters*, Rylan Molihan*, Nick Davis. RIVER VALLEY (0-6): Trevor Simpson, Layne Fitch*, Dylan Lemley*. Offensive Players of the Year: Clay Davis, Athens. Defensive Player of the Year: Logan Maxfield, Athens. Coach of the Year: Ryan Adams, Athens. TRIMBLE (8-0): Alex Coffman, Max Hooper*, Sam Ives*, Ian Joyce*, Cameron Kittle, Sawyer Koons*, Shawn Turley, Conner Wright. WATERFORD (7-1): Braden Bellville*, Peyten Stephens*, George Pantelidis*, Colin Jackson*, Zane Heiss, Joe Pantelidis. BELPRE (6-2): Jesse Collins, Gavyn Freeland, Logan Adams, Dakota Ross, Walker Feick. EASTERN (5-3): Blaise Facemyer*, Nate Durst*, Sharp Facemyer, Steve Fitzgerald. SOUTHERN (4-4): Austin Arnold*, Logan Drummer, Trey McNickle, Auston Colburn. 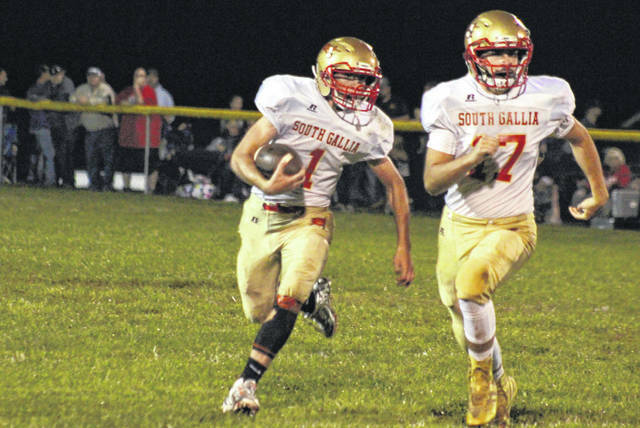 SOUTH GALLIA (3-5): Kyle Northup*, Garrett Saunders, Gavin Bevan, Justin Butler. MILLER (2-6): Heath Bidwell, Devon Crabtree, Wyatt Vollmer, Blayton Cox. WAHAMA (1-7): Jacob Fisher, Brady Bumgarner, Abram Pauley, Brayden Davenport. FEDERAL HOCKING (0-8): Mitchell Clem, Noah Robinson, Hunter Smith. Offensive Player of the Year: Conner Wright, Trimble. Defensive Player of the Year: Jesse Collins, Belpre. Coaches of the Year: Phil Farris, Trimble. * — indicates repeat selection.